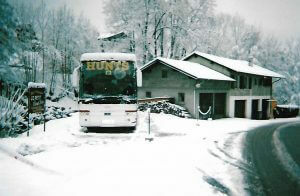 The Hunts Coaches Team wish you a very Merry Christmas and a Happy New Year. We have been busy over the last few weeks preparing for the festive break. Turkey and tinsel coach holidays prove popular and many people are visiting Christmas markets on our coaches. 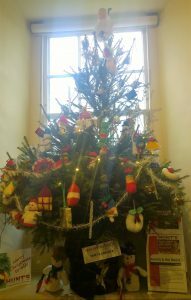 We supported the annual Christmas Tree Festival at Alford Manor House. The trees beautifully decorated by local voluntary organisations, charities and schools look wonderful. The travel office entered the Alford Town Christmas window display competition. Although we didn’t win, it was great to see children stop to enjoy the display. We all had our fill of mince pies on the late night opening and the dark nights showed the outdoor Christmas tree in its best light. 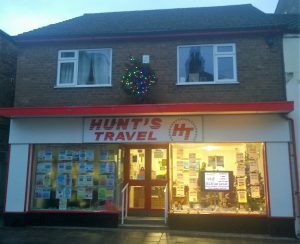 The Hunts Travel Office are holding a raffle with all proceeds to the Leicester Children’s Home, Mablethorpe. The winner will receive a hamper full of festive treats. Tickets are available exclusively from the Travel Office on West Street, Alford. There is still time to book on our holidays and day trips over the festive break and we look forward to providing your transport in 2018. Don’t forget the 2018 HOLIDAY BROCHURE is available now. As always you can contact us for Private Hire, Group Travel, Education Transport, Coach Holidays, Day Excursions & Tour Planning. As the frost and snow form a picture from our archives reminds us to wrap up warm.